Referee: Jesse Slaymaker "the Bald Eagle"
It's said Hurley suffered his first defeat at the hands of Page in a recent match. Tickets: "Ladies Will be Admitted Free"
Y. Romanoff is said ot be the brother of C. Romanoff. Breedlove is said to be claimant to the featherweight title. Takahashi is said to be the Japanese Jiu-Jitsu Wrestling Champion. "Esmond has quite a little reputation. It was less than a month ago that Esmond wrestled a draw with Mike Yokel, the former middleweight champion, at Salt Lake. He is open to engagements with all middleweight and welterweights." This took place about a week prior to April 29, 1917. 1 - Heavyweight - "Mat Warmer"
Also you could try "THE WHIP: Joy Ride Supreme" for free. The event was scheduled to be held lat Sunday, but the weather had it postponed. It is not clear if the wrestling match was also scheduled for the week before. Breedlove is billed as the World Featherweight Champion. Romanoff is billed as the Pacific Coast Welterweight Champion. The original plan for this show was Ed "Strangler" Lewis Vs. Chris Sorensen. Romanoff is listed as the Bohemian Champion of the United States. Atherton is listed as the ex-Middleweight Champion. This is meant to be Atherton's comeback. This took place prior to March 2, 1920. Kowalski claimed to be the Indiana Champion with this victory. Krieger is listed as the claimant to the Welterweight Championship. Romanoff won the first fall with a flying mare. It's said that the flying mare was a new move to the Green Bay fans. Said to be Romanoff's second appearance here. Martin Zoll is the younger brother of Carl. Romanoff was not happy with the terms. Krueger was awarded the decision when Romanoff could not continue after being knocked unconscious when he was thrown from the ring and it his head on the corner of a chair. Kovasch refused to come back for the second fall claiming he had injured his arm. The match was too rough for the police to let continue. This match took place prior to October 5, 1921. Also featured the Junction City band playing during intervals. Romonoff is listed as the Pacific Coast Middleweight Champion. Fred Bartell, of Wichita, ex-welterweight champion, challenged the winner of the main event. Romonoff stated he wanted a rematch. Two children boxed as a preliminary. Romanoff is listed as the Pacific Coast Middleweight Champion. Dematres failed to come back for the second fall. Kid McDowell challlenged the winner of match 2. Guthrie, Tony Ross, Young Loudis and Dutch Mantell all challenged the winner. This result is as per a letter sent to the Newton Evening Kansan-Republican. The Belleville Telescope on January 19 reports that the match was a draw. The match is stopped due to roughness. Romanoff is announced as "Pacific Coast Welterweight Champion." The clipping this match is from reports it as being January 20, 1922, however, that's unlikely as there was definitely another match on January 20. Romonoff is listed as the Pacific Coast Welter and Middleweight Champion. Attendance: "Largest Wrestling Crowd That Ever Turned Out Here"
A Kansan paper notes that Romonoff won this match while building up a match of his in a local city. Romonoff is listed as the claimant for the Pacific Coast Welterweight Champion. Romonoff was forced to spit in Doctor's face and bite his arms and feet in order to break holds. Kopfer is said to be the trainer of Tony Ross. Romanoff is listed as the Pacific Coast Champion. Originally this match was planned to be Billy Romanoff as the wrestler, but he failed to answer the challenge. Postponed due to a blizzard in the area. The wrestler could only use wrestling techniques and the boxer only boxing techniques and had to wear gloves. The wrestler needs to pin the boxer twice for three seconds to win. The boxer needs a knockout to win. Romonoff wrenched his shoulder during the match. Guthrie was a substitute for Billy Romonoff who said he wrenched his shoulder during a match in Joplin, Missouri. Romonoff could not come back to the ring following a collision with Becker whose head hit Romanoff's stomach. Romonoff also lost two teeth. Romonoff is listed as claiming Pacific Coast Welterweight Champion. Attendance: "Large: The Best of the Season"
It's said Stecher claims the Canadian and French Welterweight Championship. A boxing exhibition was also held. Romonoff is listed as the former Pacific Coast Champion. Benford broke his collar bone and had to forfeit. Postponed due to a basketball game. Also featured vaudeville stunts during intermissions. Romanoff is listed as the Oklahoma State Champion. Stecher suffered an injury upon losing the first fall. Mantell was disqualified for using four strangle holds. The match is called a draw at midnight. Kallio is listed as a claimant of the World Welterweight Championship. On the way to the ring Romanoff butted his head on an iron beam and took a dive. He had to return to the dressing to regain some of his sense and try and get a little less groggy. Matsuda is the World Welterweight Champion. 1 - Billy Romonoff (of Jackson, Miss.) def. 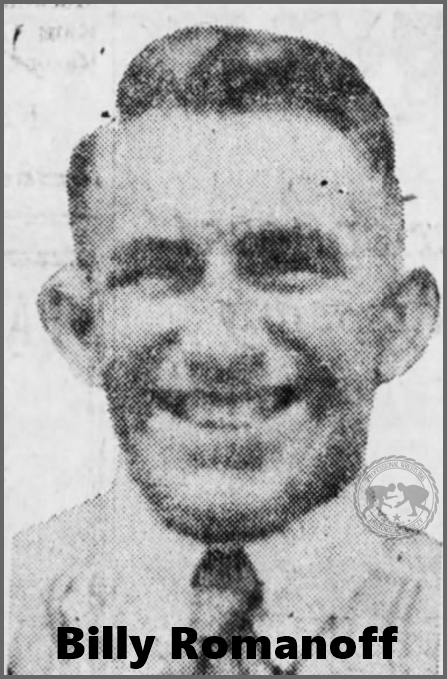 Young Gotch "Junior Middleweight"
Watkins is listed as the United States Navy Champion. Maning is said to be claimant to the welterweight title. Johnson was unable to continue following the first fall. Maning is disqualified for using closed fists to punch. A riot nearly broke out at the decision.